Outbound Fax Settings is where you can change the information for your outbound fax. You can edit the cover page information, set up the outbound fax number and email addresses permitted to send faxes. Follow the steps below to view and customize your Outbound Fax Settings. Go to Settings > Outbound Calls/Faxes > Fax Settings. Continue to Outbound Fax Settings. Under Users with extensions, select the name of the User that you want to modify, and then click on Outbound Calls/Faxes. Under Outbound Calls/Faxes, click Fax Settings. 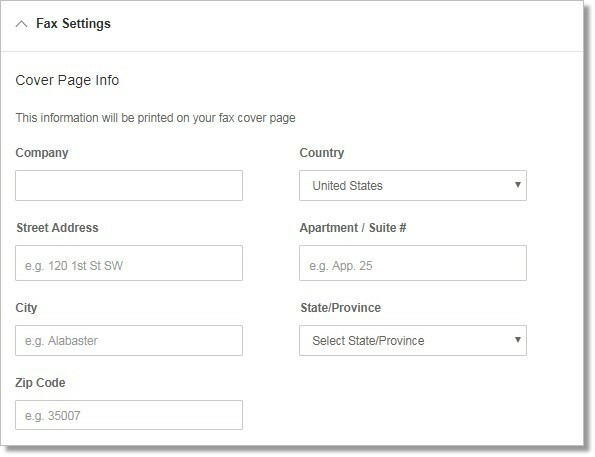 You can customize the information that will be printed on your fax cover page. Note: You can click Save at any time. You can select a phone number you want to display as your Caller ID number for Fax Number. Click on the radio button of the number that you want to display as your Caller ID and click Done to save your settings. Click Save when redirected back to Fax Settings to confirm. The cover page is used to identify who the fax is from and who the intended recipient of the fax is. It does not have to be used if not needed. You can select the default cover page format you want to use from the preset templates. Click the drop-down arrow to select from the preset templates and click Done to save your settings. You can add up to 25 additional emails to send faxes in this section. Click the On radio button under Omit cover page when email subject is blank to enable. Enter the email address on the Email addresses permitted to send faxes field and click Add. Note: If this option is selected, the cover page will be used when you send a fax via email with a subject line. If you send it without a subject line, the cover page will not be used. QUICK TIP: For more information about sending faxes via email, go to Sending Office@Hand fax messages.